Monday, December 3: Jersey Day – Wear a jersey to school to support your favorite sports team. Tuesday, December 4: Spirit Day – Show off your school spirit by wearing green and gold! Wednesday, December 5: Tacky Tourist – Pull out the fanny packs and cameras for a day of cheesy sightseeing. Thursday, December 6: Crazy Heads to Toes Day – Bust out your crazy socks, mismatched clothing, and wacky hair on Crazy Heads to Toes Day. Friday, December 7: Skype Day – Dress up like you are having an interview over Skype. Wear something formal on top, but wear more casual, comfy clothes on the bottom. Monday, December 10: Why Do I Have This In My Closet Day – Wear the strangest thing hanging in your closet. Wednesday, December 12: Twin Day – Grab a friend and dress alike for the day. Thursday, December 13: Retro Day – Go back in time and bring back your favorite decade by dressing up in popular clothing from that era. 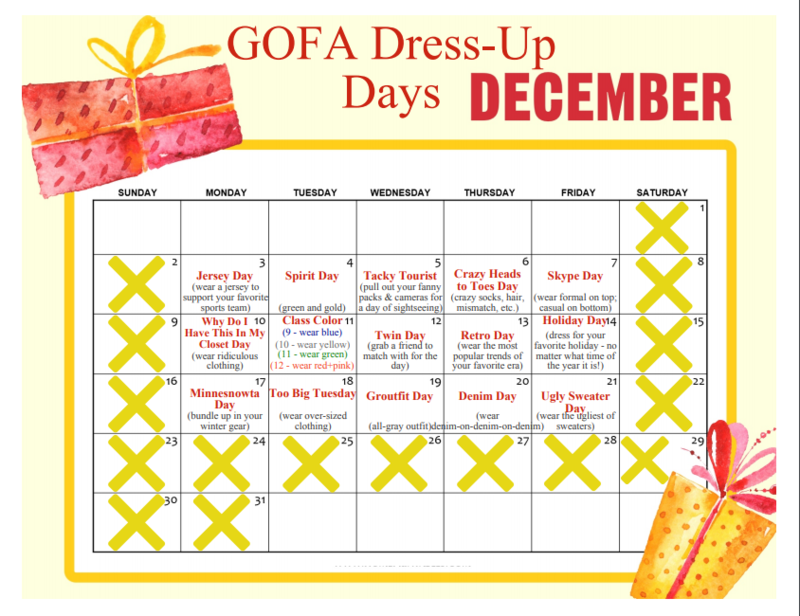 Friday, December 14: Holiday Day – Dress for your favorite holiday — no matter what time of the year it is! Monday, December 17: Minnesnowta Day – Bundle up in your layers of winter gear for Minnesnowta Day. Tuesday, December 18: Too Big Tuesday – Raid your parents’ or older siblings’ closet for some oversized clothing. Wednesday, December 19: Groutfit Day – Groutfit (noun): an outfit made completely of gray; a gray top and gray bottoms. Thursday, December 20: Denim Day – To achieve the ultimate denim-on-denim-on-denim-on-denim look, wear a denim jacket over your denim vest over your denim dress or skirt, over your denim overalls or denim jeans. Friday, December 21: Ugly Sweater Day – Be the one to wear the ugliest of sweaters! We hope to see everyone decked-out in their most creative and unique outfits!